You do everything in your power to keep the kids safe while in your care. Now’s the time to teach them some things they can do to keep themselves safe. A few simple things can help you feel a little bit better about sending them out into the world. It’s great to take and share pictures of the first day. Consider not including the name of the school in your pictures. I love seeing little ones getting on the bus but don’t need to know the name of the school or the district. Seeing them all decked out in the new clothes and backpack in front of school is adorable too. But now I know what your child looks like and where they go to school. Something you might not want the world to know. Backpacks can be black holes. It’s no secret that kids are given homework. Hauling books back and forth to school is enough. Check their backpacks frequently (maybe each Friday bags are dumped and cleaned?) to make sure paperwork isn’t stuffed in there or a forgotten snack fell to the bottom of the bag and started growing fuzz. Science is great at school, just not in your backpack. Another thing to think about is where that bag’s been-in a locker, the bus floor, dragged down the street. Shall I continue? Consider washing it every so often to get rid of some of the germs. Having a handy bottle of hand sanitizer on their bag isn’t a bad idea either. Good Fit Isn’t Just for Clothes. Still on the backpack mindset. Make sure the bag isn’t too big for their frame. Having the wrong size or type of bag can lead to injuries. This might mean having an extra bag on hand to accommodate for a growth spurt during the year. Making sure the straps are adjusted correctly can help too as well as carrying the bag on both shoulders instead of just over one. Have the kiddos pick a buddy to sit with on the bus. If that buddy isn’t on the bus, let the driver know. This could help make sure their stop isn’t missed or the child is still at school. When getting on or off the bus, remind the kids to take several steps out from the bus and give the driver a wave. When they can see the driver, the driver can see them. You might not be able to be at the bus stop every day but chances are another mom is. Take a second to introduce yourself and your kids so she can help you out by keeping an eye on them when you can’t be there. Bonus-you might get a new friend out of the deal! 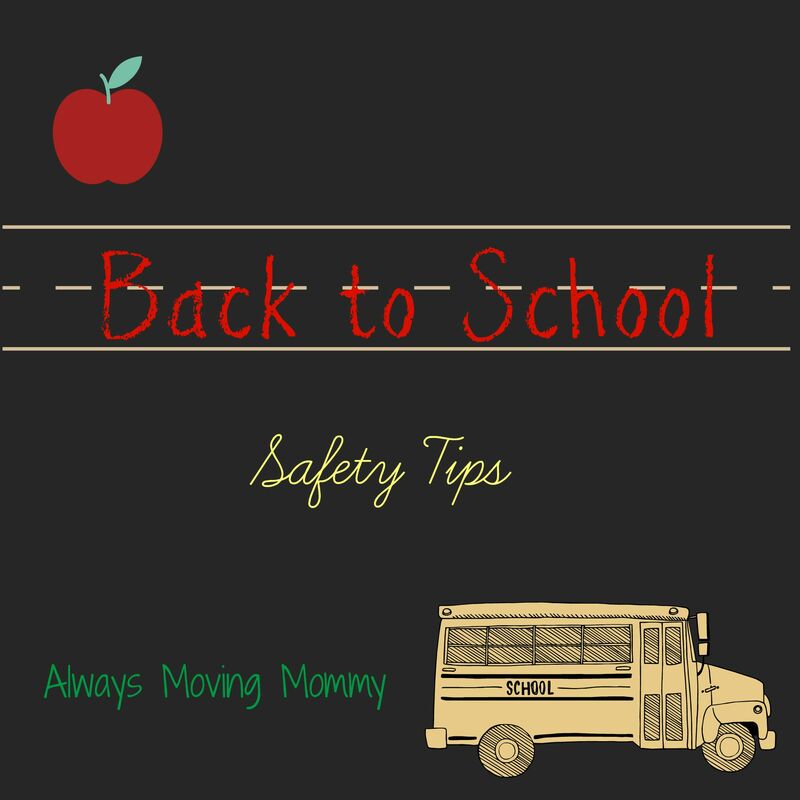 What are some things you do to help your kiddos stay safe when heading back to school?